[M. x soulangeana], cv. (Louis Van Houtte, Ghent, Belgium, before 1900), per Kruessmann, Handb. Laubg. 2: 105 (1961). 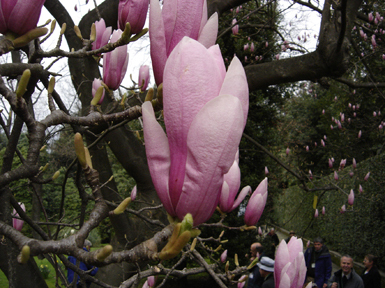 As M. Van Houttei in Millais, Magnolias 242 (1927), ‘Probably a seedling from M. lennei which it resembles in leaf character, but the flowers are smaller and almost black-purple on the outside. A rare hybrid seldom seen in English gardens, but still cultivated in Belgium. There are some fine specimen plants at Leonardslee, Sussex. (blooms late) flowers in early May.’ Compare M. cv. Louis Van Houtte, which probably = M. liliiflora cv. Reflorescens. [M. grandiflora], cv. (Todaro, Index Sem. Horti Reg. Bot. Panormitani, p, 24, 1888, Panormi, Italy), ex Pampanini, Bull. Soc. Tosc. Ort.41: 106 (1916), nomen nudum. [M. acuminata], cv. (Ellwanger & Barry, Descr. Catalogue, p. 4. 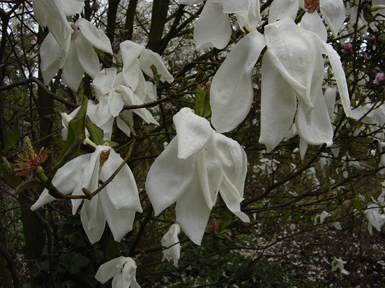 1855), ‘A seedling of acuminata raised here, with broad conspicuous silvery blotches on the foliage; quite new; this is the first variegated leaved magnolia we have found.’ This must be a silvery-white variegated cultivar. Quite different from the next. [M. acuminata], var. (per Bean, Trees & Shrubs 2: 67, 1914), described with leaves handsomely blotched with golden yellow. This must be the same as M. acuminata var. aurea of Nicholson in 1683. [M. grandiflora], cv. (W. D. in The Garden 73: 432. 1909), leaves marked with yellow. Compare cv. Foliis Variegatis (marked white). [M. sieboldii], cv. (Nakai, Fl. Sylv. Kor. 20: 120. 1933), as forma of M. parviflora. Leaves variegated white. Mt. Chiisan, Korea. [M. x soulangeana], cv. (Hort. Walraad ex Schelle in Beissner et Al., Handb. Laubholz-Benennung 99. 1903), nomen nudum. [M. x veitchii], cv. 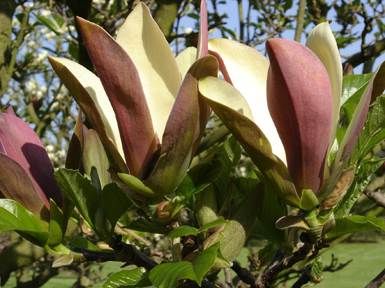 (Treseder's Nurseries, List, p. 8, circa 1965, Truro, Cornwall, England), ‘the salmon pink clone which carried the grex name is one of the most vigorous free-flowering of the tree magnolias. It needs shelter as the wood is remarkably brittle.’ received an F. C. C. in 1921 from the Royal Horticultural Society. [M. grandiflora], cv. (Loudon, Arb. Frut. Brit. 1: 262. 1838), nomen nudum. Cultivated in Horticultural Society of London's Garden, 1834. [M. x soulangeana], cv. (Pitkin, Arb. Bull. Univ. Wash. 10 (4): 14. 1947). Probably = cv. Verbanica. [M. denudata], cv. (Pampanini, Bull. Soc. Tosc. Ort.40: 213. 1915) M. x soulangeana cv. Verbanica. [M. grandiflora], cv. (L. H. Bailey, Hortus 381. 1930), as M. victoria. Leaves very red-rusty underneath. from Victoria, B. C., Canada. Considered one of hardiest cultivars in Oregon. [M. liliiflora, M. x veitchii], cv. (Gresham, Morris Arb. Bull. 13: 48. 1962), young leaves bronzy-red, veins and stipules red; flowers dark wine-red, heavy-textured. (M. liliiflora x M. x veitchii). [M. virginiana], var. - the typical variety. [M. grandiflora], cv. (Regel, Cat, Pl, Hort. Aksakov., p. 88. 1860, (Leningrad, U.S.S.R.), ex Pampanini, Bull. Soc. Tosc. Ort.41: 107 (1916), nomen nudum. [M. denudata x M. 'Vulcan'] cv. 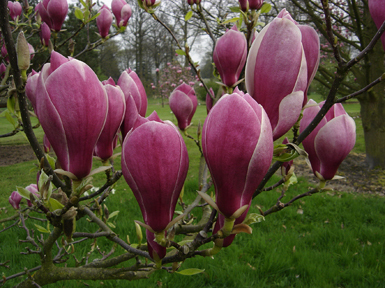 (Magnolia 40(1) [Issue 77]: 17, 2005)The distinctive, burgundy-red (RHS 59A)flowers of this hybrid are produced early in the season and have a fruity fragrance; flowers fade slightly to a clear lilac-purple (RHS 72A) toward the tips and margins; inner surface of tepals is a more muted purple with a speckled pigmentation toward the margins and tips; tepals are 11cm (4.3in) long and 6cm (2.3in) wide; habit is upright when young, becoming more rounded with age; estimated height at maturity is 7-10m (23-33ft); predicted hardy to USDA zone 8 (possibly 7); originated at Duncan & Davies Nurseries of New Plymouth, Taranaki, New Zealand; selected and named by Vance Hooper, registered on September 12, 2004 by Jim Rumbal. [M. acuminata], var. (Seringe, Fl. Jard. 3: 2290 1849) = var. acuminata. [M. stellata], cv. (Otto Eisenhut Nursery Catalog, p, 3, 1989, Ticino, Switzerland). Nomen nudum. [M. kobus], cv. (Kammerer, Morton Arb. Bull. 34: 22, 1959), Probably = M. x kewensis cv. Wada's Memory. [M. kobus], cv. (Kruessmann, Index Tremontensis P. 75. 1970, Dortmund Botanic Garden, Germany) = M. x kewensis cv. Wada's Memory. [M. denudata], cv. (Wada, Hakoneya Nurseries, Yokohama, Japan), First question in Newsl. Amer. 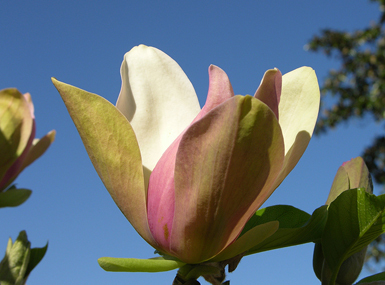 Magnol. Soc. 3 (1): 8 (1966), given as cv. Picture. See Savage, Newsl. Amer. Magnol. Soc. 2 (1): 2, 3 (1965) illustrated on p. 3 as ‘Wade's Picture’ (sic) = M. x soulangeana cv. Picture. [M. denudata, M. salicifolia], cv. (Magnolia 20(1) [Issue 37]: 20, 1984). ‘Snow white flowers with an exquisite fragrance, produced at an early age. It is more vigorous than either parent. (Newsl. Amer. Mag. Soc. 15(1): 11, 1979)’ = cv. Snow White, AM 1991. (M. denudata x M. salicifolia). [M. sprengeri], cv. (Henry Price, Jour. Roy. Hort, Soc. 73: 353. 1948), as M. sprengeri Diva Wakehurst seedling. A. M. 1948. flowers colored phlox pink (RHS 625/3) inside, and solferino purple (RHS 26/3) outside. exhibited by Sir Henry Price, Wakehurst Place, Ardingly, Sussex, England. [M. acuminata subsp. subcordata], cv. (Treseder’s Nurseries Catalog, p. 2, circa 1965, Truro, Cornwall, England), nomen nudum. [M. stellata], cv. (Hilliers Man. of Trees and Shrubs, Ed. 2. 1973). 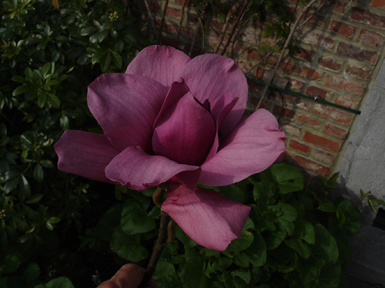 ‘An outstanding form of Japanese origin, with larger flowers and more numerous petals.’ May be distinct from cv. Waterlily. [M. stellata], cv. (Greenbrier Farms, Inc., Norfolk, Virginia, 1939). Kammerer, Morton Arb. Bull. 14: 23 (1939) and 15: 24 (1940), ‘flowers creamy-white, cup-shaped, tepals of great substance, displayed in an upright position... later blooming.’ Wister, Swarthmore Plant Notes, Ed. 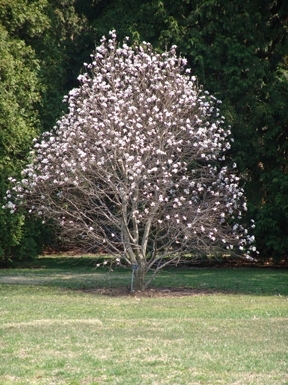 3, 1 (1): 83 (1955-56), ‘pyramidal, more upright, bushy, twiggy, faster growing than stellata. Fls. 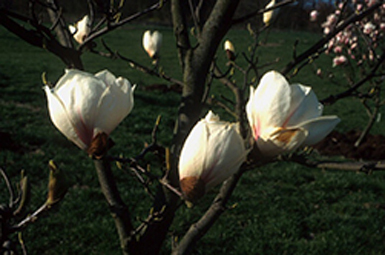 later, larger, and narrower petals.’ See Wyman, Arnoldia 20: 26 (1960). This is the second cultivar to receive this name per Neil G. Treseder. [wieseneri] [M. x wieseneri], var. - the typical variety. [M. stellata], cv. (Iufer Landscape Co., Nursery List, 1961, Salem, Oregon), nomen nudum. Probably = var. stellata. [M. x soulangeana], cv. (Kelsey & Dayton, Stand. Pl. Names, Ed. 2, P. 377. 1942), per synonymy = cv. Alba Superba. In Armstrong Nurseries, Cat. p. 44 (1948), Ontario, California, ‘with flowers often 7-8 in. across, pure white inside, tinted pinkish lavender outside.’ in Plant Buyers Guide, Ed. 5, p. 169 (1949). Compare cv. Alba. [M. campbellii], cv. (J. C. Williams, Jour. Roy. Hort. Soc. 76: 218. 1951), raised from seed sent from India. Flowers large, cupshaped, cream-colored, tepals 12, obovate, 5 in, long, 3 in. wide, stamens purplish-rose. Gard. Chron III, 129: 119 (1951). 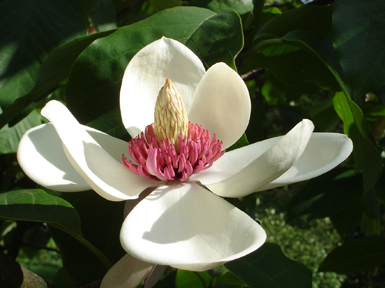 figured in Johnstone, Asiatic Magnol. Fig. 4 facing p. 49 (1955) plant originated at Caerhays Castle, Cornwall, England. [M. cylindrica, M. denudata(? ), M. campbellii var. alba(? )], cv. (Magnolia 31(1) [Issue 59]: 18-19, 1996). 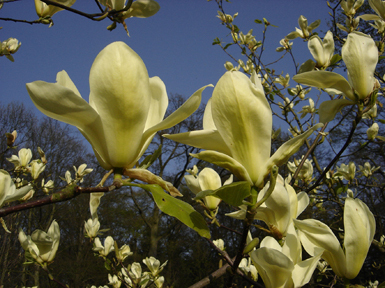 ‘This plant arose as a seeling acquired by Philippe de Spoelberch, Wespelaar, Belgium, from Esveld Nurseries in Holland as Magnolia cylindrica. Philippe believes that the pollen parent is M. campbellii var. alba because of the large cup-and saucer type flowers. Each flower has 9 very large creamy white tepals, the 3 internal tepals forming the cup and 6 outer tepals forming the saucer, all tepals have a thick texture. The tepals are acute, not rounded, and are twisted. 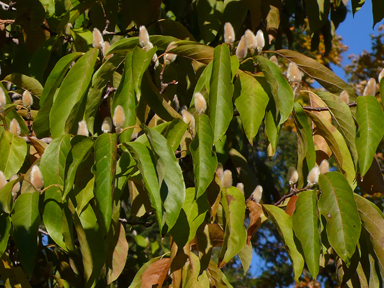 The tree is early flowering, 6 meters tall at 10 years of age, and upright branching. It reportedly does not propagate easily from cuttings. Hardy to -18°C. Named and registered by Philippe de Spoelberch in 1995.’ = M. ‘Leda’ [for explanation and name change, see that cultivar]. [M. x loebneri], cv. (Magnolia 25(1) [Issue 47]: 20, 1989). 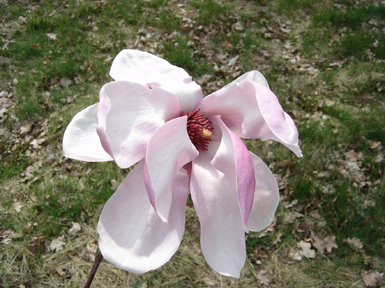 ‘Raised from open pollinated seed of M. ‘Ballerina’ obtained from the Magnolia Society seed counter in 1976. 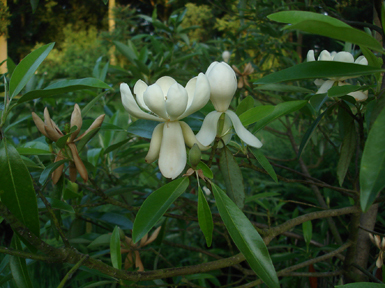 Produces white flowers with an average of 22 tepals, 4 CM. long by 2 CM. wide; first bloomed in 1985. Tepals remain firm, flaring upward and outward, never becoming flat or droopy.’ Registered by W. J. Seidl, 732 S. 19th St., Manitowoc, Wisconsin 54220. [M. x soulangeana], cv. (Pitkin, Arb. Bull. Univ. Wash. 10 (4): 14. 1947), flowers white, Probably = cv. Alba. [M. stellata], cv. (Westbury Rose Co., Spring 1958 Catalog. p. 6, Westbury, Long Island, N.Y.), ‘dense habit; early pure white star-like flowers.’ Probably = cv. Halleana. [M. macrophylla], cv. (registered, 1974, BY J. C. McDaniel, Urbana, Ill.). Purple markings unusually prominent on flowers with exceptionally large size and bearing extra tepals. Seed source unknown; plant hardy in zone 6a. cross-compatible with M. ashei. [M. obovata, M. x wieseneri], cv. (Magnolia 31(1) [Issue 59]: 19, 1996). 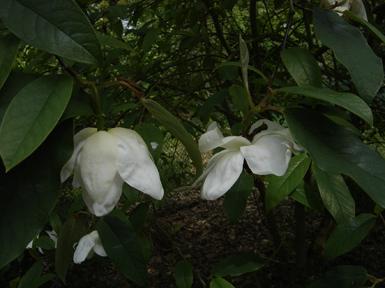 ‘From the garden of Sir Peter Smithers, ‘William Watson’ arose as a chance seedling of M. x wieseneri, probably pollinated by a nearby M. hypoleuca which was in bloom at the same time. Only one seed pod has been produced on wieseneri in this garden in 24 years. ‘William Watson’ was the first of these seedlings to flower. It grew very rapidly into a tall plant with leaves and flowers larger than the seed parent. Flowers are slightly different in shape than wieseneri but have the same fragrance as the seed parent. Registered by Sir Peter Smithers, Switzerland, and named in honor of William Watson, Assistant Curator at Kew in 1889 when wieseneri was first named. Material is being propagated by Otto Eisenhut….’ = M. wieseneri x M. hypoleuca. [M. campbellii], convar. (Johnstone, Asiatic Magnol. 61, Fig. 56 1955), flowers deep purple (in ssp, mollicomata). See cv. Lanarth. [M. x loebneri], cv. (M. P. Borlase, Rhod. with Cam. & Mag. 41: 61. 1988). Nomen nudum. = M. x loebneri cv. Willowwood. [M. virginiana], cv. (Magnolia 28(1) [Issue 53]: 17, 1992). 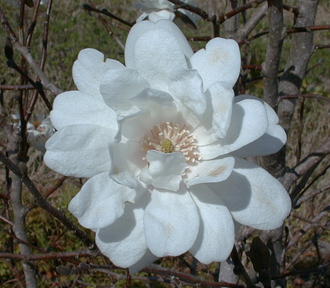 ‘This cultivar is selected from the evergreen variety of Magnolia virginiana. It has a habit which is typical of that variety, but with noticeably narrower leaves which appear to be densely clustered near the ends of the branches, giving the tree a more refined foliage texture than typical. The tree is floriferous, with flowers typical in size. The flowers continue to appear in small numbers after the main flush of bloom. The original tree is about 10 years old, 20 feet tall with a 5-6 foot spread. It was planted in an exposed location, yet survived -12ÆF with no foliage damage. It has also survived severe early fall and late spring freezes with no damage.’ (M. virginiana var. australis). [M. kobus], cv. (Blackburn, Baileya 5: 12. 1957) = M. x loebneri cv. Willowwood. [M. x loebneri], cv. (Blackburn, Gard. Jour. 2: 44. 1952), flowers to 7 in. across, blooms abundantly, tepals 11-14. Type tree at Willowwood Arboretum of Rutgers University in Gladstone, N. J. [M. parviflora], var. (Finet & Gagnepain, Mem. Soc. Bot. France 1 (4) 39. 1906) = M. wilsonii. [M. wilsonii], var. - the typical variety. [M. x soulangeana, M. x veitchii(? )], cv. (Otto Eisenhut nursery catalog, p. 2, 1989, Ticino, Switzerland). ‘JG 15.’ Nomen nudum. (Callaway, Dorothy J. The World of Magnolias, p. 231, 1994). 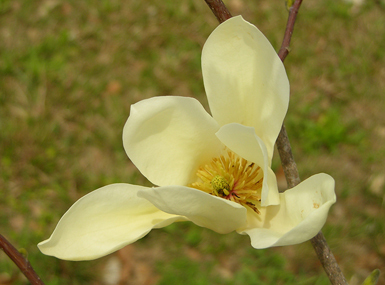 ‘Flowers are large, opening later than those of most Gresham hybrids. Flowers have 9 thick tepals which are reddish purple at the base, becoming lighter at the tip, and 4-5 in. (10.2-12.7 cm) long. 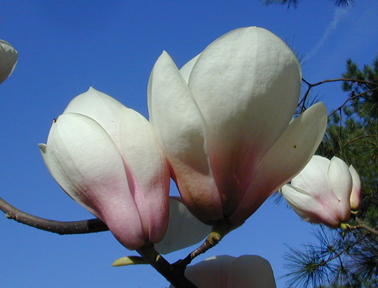 Selected from Todd Gresham's hybrids at Gloster Arboretum, Gloster, Mississippi, by John Allen Smith of Magnolia Nursery, Chunchula, Alabama.’ (parentage unknown). [M. tripetala], cv. (Registered, 1974, by J. C. McDaniel). Original tree in Woodlawn Cemetery, Urbana, Illinois bears exceptionally large fruit aggregates for this species, and somewhat larger than average flowers. [M. x brooklynensis], cv. (J. C. McDaniel in Plants and Gardens 30 (1): 75-76 and in American Nurseryman 140 (3): 88-90). Registered 1974. Fertile f1 hybrid, hardier than M. liliiflora and with larger flowers; colors a blend of those of M. acuminata and M. liliiflora cv. O'Neill. 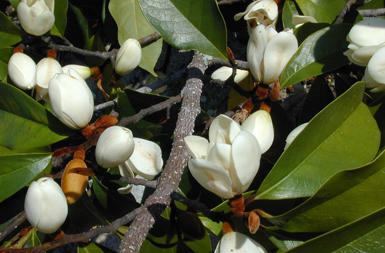 Flowering season overlaps parents, later than M. x soulangeana. bred by J. C. McDaniel at Urbana, Ill.
[M. grandiflora], cv. (Magnolia 20(1) [Issue 37]: 20, 1984). 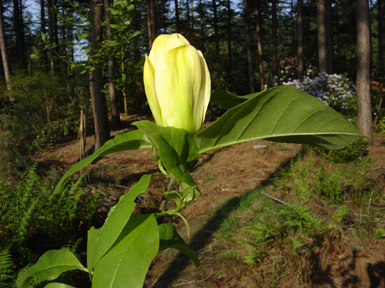 ‘Plant of compact growth habit; 20 feet tall, 15 feet wide after 25 years. Blooms April to November. 10-11 white tepals 3 inches long and 2 inches wide. Stamens red at base. Leaves small, 6 inches long, 3 inches wide, with wavy edges and light brown indumentum.’ Registered by Ken Durio, Opelousas, Louisiana. [M. x soulangeana], cv. (Carl E. Kern, Jr., Wyoming Nurseries, Cincinnati 15, Ohio, before 1961), per letter from David G. Leach to John M. Fogg. Jr. dated 20 December 196l. nomen nudum. Listed by D. Todd. Gresham, Santa Cruz, California, as cv. Wyoming. [M. x brooklynensis, M. cordata], cv. (Magnolia 20(1) [Issue 37]: 20, 1984). ‘A hybrid selected from several siblings for the intense yellow color and compact, upright shape of its flowers. Blooms earlier than acuminata var. 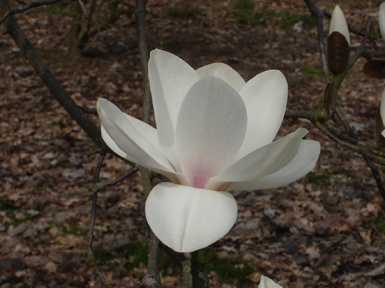 subcordata [here, cordata] and flowers are larger and a deeper yellow.’ Registered by Lola Koerting, Kitchawan Research Lab., Brooklyn Botanic Garden, Ossining, New York (Magnolia 17(2): 30, 1981). (M. x brooklynensis cv. Evamaria x M. cordata). [M. acuminata, M. denudata], cv. (Magnolia 20(1) [Issue 37]: 20, 1984). 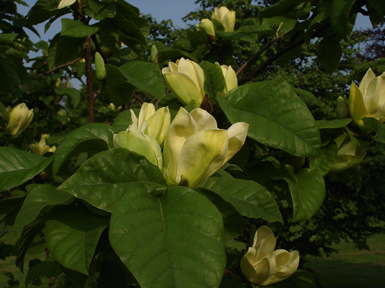 ‘A large upright plant with fragrant, large, yellow flowers, possessing a light pink flush on the outside of the tepals. 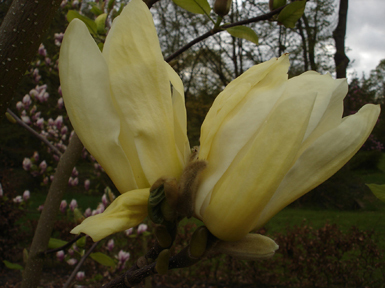 The yellow color of the 4 to 5-inch buds fades to an ivory cream as they open. Flowers appear before the foliage.’ Registered by Ken Durio, Opelousas, Louisiana. (M. acuminata x M. denudata). [M. acuminata, M. denudata], cv. (Magnolia 21(2) Issue 42]: 12, 1986-7). ‘Six tepals, interior R.H.S. yellow 8D, exterior midrib yellow-green 150C, pistils 150B; anthers yellow 10C, maroon at base. Corolla 19 CM. wide by 78.5 CM. long.’ Registered by David Leach, 1894 Hubbard Rd., North Madison, Ohio 44057. (M. acuminata x M. denudata). [M. acuminata subsp. subcordata, M. x soulangeana], cv. (Magnolia 21(2) [Issue 42]: 12, 1986-7). 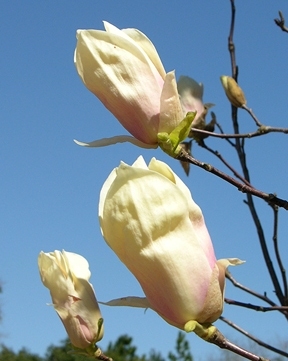 ‘Flower buds large and furry, not enclosed with leaf buds, and open well before leaf buds, which are late in vegetating. Flowers are a clear, even lemon yellow, without green striping, as large and long-lived as ‘Alexandrina’ and retaining the ‘tulip’ shape until they shatter. An upright, symmetrical tree, with a single leader.’ Registered by Phil Savage, Jr., 2150 Woodward Ave., Bloomfield Hills, Michigan 48013. (M. acuminata var. subcordata [here, M. cordata] cv. Miss Honeybee x M. x soulangeana cv. Alexandrina). [M. x brooklynensis, M. cordata], cv. (John Gallagher, Rhod. with Cam. & Mag. 41: 31. 1988). = M. x brooklynensis cv. Yellow Bird. [M. yulan], var. - The typical variety = M. denudata.